The Nanny Diaries is based on the novel by Emma McLaughlin and Nicola Kraus in this witty comedy directed by Shari Springer Berman and Robert Pulcini that revolves around a naive yet comical college graduate played by the delightful Scarlett Johansson who decides to take a role as a nanny. Unfortunately for Johansson's character, she is unwittingly drawn into a rich social elite of a New York family and somehow begins a permanent fixture of the household. Unable to follow the strict rules of her employer and keeping her son in line, she eventually forms a bond with son as she tries to salvage this dysfunctional family. 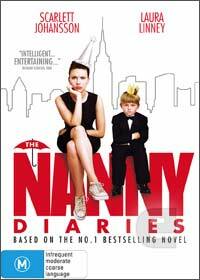 Featuring romance, comedy and drama, the Nanny Diaries is almost a snap shot of high society life in New York that gives the viewer a true insight into all the characters of this movie with their quirky dysfunctional behaviors in a light hearted comedy that once again proves money cannot buy happiness. Johansson is once again the star of this movie and even though many viewers may not believe she is a comedic actress, her character is thoroughly enjoyable to watch.